Each of the two containers of this rare example would normally be classified as cylindrical, although in fact they are not. They are elongated ovoid shapes, and even a length taken out of the mid-section of the bottle, which might appear to be a cylinder, is in fact tapering and, therefore conical. However, the general rule in snuff-bottle terminology is to allow the term ‘cylindrical’ to act as a gravitational force attracting anything that resembles a cylinder. There is also an intriguing illusion that they are compressed a good deal more than they are when comparing the narrow-, and main-side views caused by the impression of greater width because they are doubled. In fact the degree of compression of each flask is very slight. This is an eccentric formal solution to joining two identical shapes. Instead of making the joint wall common, the two are seen as separate forms joined by an extra area. Part of this is an optical illusion created by the additional membrane between the shoulders, which is added in order to join them attractively and, probably, for additional strength. 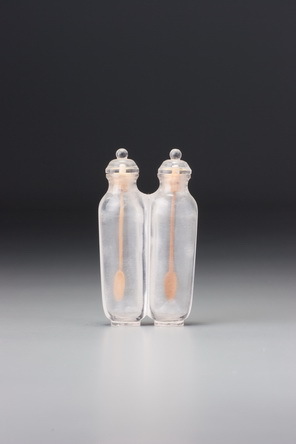 Because the two containers are flared apart from each other vertically, below a roughly central line the two begin to share some common area of wall, but the impression is of two independent bottles joined by a membrane of crystal. The slight flaring of the two vessels away from each other is an intriguing touch, lending tension to the sculptural balance and creating from the negative space between the necks a positive element that accounts for some of the formal appeal of the work of art, particularly with the stoppers in place. Part of the formal appeal of this bottle is achieved by balancing the eccentric flaring and joining of the two vessels with the excellent formal integrity of each (excepting the necessary asymmetry of the overlapping wall areas). Had the form of the two individual vessels been less than perfect, the eccentric method of joining them would have lost its confidence and appeared more as a technical shortcoming than an intentional formal statement. By balancing the highly individual and rather organic joint and the flaring with perfectly controlled formal integrity, the artist has made quite sure that we do not mistake his eccentricity for clumsiness. That one form of ideal stopper for a flared neck is the official’s-hat stopper is a principle confirmed by the two obviously original stoppers of this bottle. The tentative imperial attribution here is based upon two main features and a general belief that a great many undecorated bottles in various hardstones must have been made at and for the court. The only real evidence here rests in the obviously original matching stoppers, which are a standard for the court and would certainly have been a staple in the palace workshops, and upon the flat, upper neck rim, another known palace feature. There is one further, although admittedly extremely tenuous, indication of a possible imperial provenance. 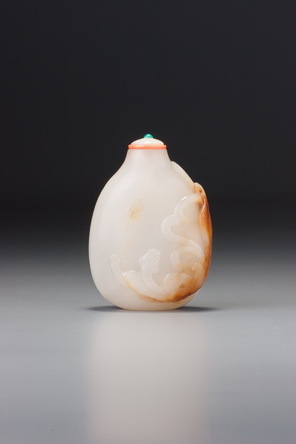 There was a tendency during the mid-Qing period for imperial production to expand into bizarre forms and types to satisfy a rather jaded palette amongst members of the ruling elite, many of whom appear to have been collectors of snuff bottles, often on a grand scale.